We are currently in bright time (near full moon) and the currently active instruments, LRS2 and VIRUS are really designed to operate in dark time (when the moon is below the horizon), thus we spent this week analyzing the data taken in the last dark run, testing and updating the telescope control software and training the night time staff to make sure all of the staff have the same skills and knowledge of the system for the upcoming dark run. One of the problems we were having in the last dark run was a mysterious end of track due to a hexapod hitting the software limit. Further investigation has revealed that this limit is part of the natural extension of the warming tracker. As the steel structure expands from warmer temperatures we have to move the hexapods down to compensate. We also found that we had set the software limits fairly far from the limit switches so we could give ourselves plenty more room without any changes to the hardware of the telescope. This is an example of the type of tuning that we continue to have to do with the control algorithms. Both the LRS and the VIRUS are IFU (Integral Field Unit) spectrographs, which means that one could take the spectra for each fiber and reconstruct an image of the field which was observed. Below is the very first reconstruction that we did for a VIRUS field. It was a fairly bright (8th mag) standard star. The image scale is set very wide so that we can see all of the interesting features that come from the unusual design of the HET. The six image spikes comes from the edges of the hexagonal HET segments, and the stronger spikes along the X direction come from the tracker Y superstructure. 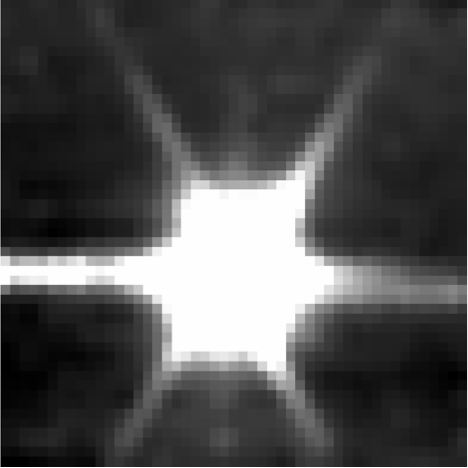 First reconstructed IFU image from VIRUS. A very bright 8th mag standard star with the stretch set very wide to show all features. 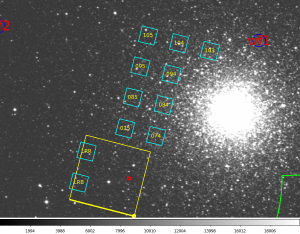 Not long after generating this the software team was able to reconstruct a number of images for each IFU in a pointing of a globular cluster, NGC5272. Below I show a couple of examples of these. Here is a schematic of what the current array of IFUs would look like compared to a Digitized Sky Survey Image of the field we pointed at. This is a by-product of our current setup software. 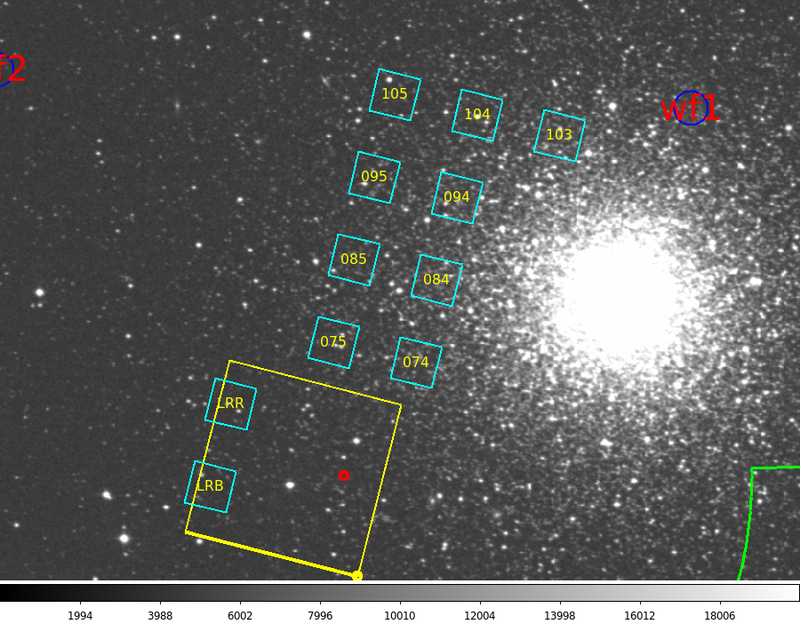 Image made by our setup software to help the astronomer understand where we are pointed. This entry was posted in Observing, VIRUS, WFU on April 25, 2016 by shetrone.